Rockford was originally named Laphamville in 1856. The Indiana Railroad Company and Grand Rapids suggested for them to select a new name in 1865, when the railroad extended through the village. June of 1866 the Village of Rockford was its new name, home to 315 residents. 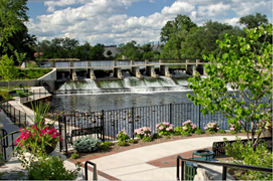 Rockford is highly known for having over 30 acres of land and waterfront parks for every ones enjoyment and use, to list a few, Peppler Park, Garden Club Park, Glen Park, Pickett Park, Richardson-Sowerby Park and Rotary Jaycee Park. The White Pine Trial runs along the Rogue River, beginning at Peppler Park and goes through downtown Rockford covering 4.5 acres of land. Rockford became a city 50 years ago and since then its school district has gone from one building to nine buildings, educating 3,744 students. Having a large school district has not setback Rockford Public Schools, they are the only school district with its large numbers to earn the Blue Ribbon School Exemplary State Board of Education Award in Michigan, a program initiated by the U.S. government recognizing schools where the achievement gap has been narrowed.